State legislation that would increase protection for Puget Sound’s killer whales died this week amidst confusing action on the Senate floor. Now, orca advocates are pushing a narrower bill approved by the House to limit remote-controlled aircraft around whales, while they also hope for a $3-million budget appropriation to support other orca protection measures. J pod, one of the three Southern Resident killer whale groups, has recently spent time in the San Juan Islands. Photo: Dave Ellifrit, Center for Whale Research, taken under federal permits: NMFS:15569-01, DFO SARA: 388. Whether people should be allowed to fly a drone around the endangered Southern Resident orcas seems to be the issue stirring up the most attention in the Legislature — although it is a small part of the overall effort. Current law prohibits a “vessel or other object” from approaching the Southern Residents closer than 200 yards. Using that language, state fisheries enforcement officers have issued at least two citations to people flying their drones over orcas in the San Juan Islands, according to Sgt. Russ Mullins of Washington Department of Fish and Wildlife. In one case filed in 2015, a Mercer Island photographer appealed the citation, saying the law does not apply to drones. The prosecutor in San Juan County eventually dropped the case while requesting a legal clarification from the state Attorney General’s Office. The opinion from the AG’s Office says the 200-yard limitation for “other objects” should apply to drones flying over the killer whales. The final word, however, would need to come from a judge in a state court. To eliminate any confusion, Rep. Kristine Lytton, D-Anacortes, last year introduced a bill that would prohibit “unmanned aerial systems” from approaching orcas closer than 200 yards in any direction. The one exception would be if the drone inadvertently flies over the whales while traveling to an unrelated destination. See info for HB 1031. “My intention is to keep drones away from an icon of our state and to prevent the almost harassment, as some people in my district feel, of our orca whales,” Rep. Lytton testified after submitting her bill. The concern is not so much about one or two drones, although any could crash and harm a whale, Sgt. Mullins told me. But if the rules do not keep drones away from the whales, it will be only a matter of time before lots and lots of whale watchers bring their drones out to photograph the orcas up close while watching from a boat. Some lawmakers, including Rep. Jeff Morris, D-Mount Vernon, said they would prefer to broaden the legislation to keep drones from operating around any threatened and endangered species. But no changes have been made so far, perhaps because the specific law being revised is focused entirely on the protection of killer whales. The bill to protect orcas from drones passed the House last week on a vote of 67 to 31, with all Democrats in support of the legislation along with about a third of the House Republicans. In the Senate, Democrats decided to take a broader approach to the issue of orca protection. Sen. Kevin Ranker, D-Orcas Island, introduced a bill to complement Gov. Jay Inslee’s proposed orca protection and restoration initiative. The legislation, SB 6268, would more than double the number of marine patrols around the orcas, essentially protecting the animals from aggressive boaters and drone operators anytime the whales are in Puget Sound. Studies have shown that the mere presence of patrol boats leads to greater compliance with the rules, which are designed to allow the whales to find food more easily and to engage in more normal social interactions. The patrols also serve to educate boaters about how to act around the whales. The cost for the nearly full-time patrols is estimated at about $475,000 per year. If the patrols help save the whales from extinction, it would allow a continuation of the multi-million-dollar tourism industry, not to mention the ecological importance of orcas and the joy that people experience when seeing whales. Other provisions of the bill would require boaters to slow down to 7 knots anytime they come within 400 yards of a Southern Resident orca. 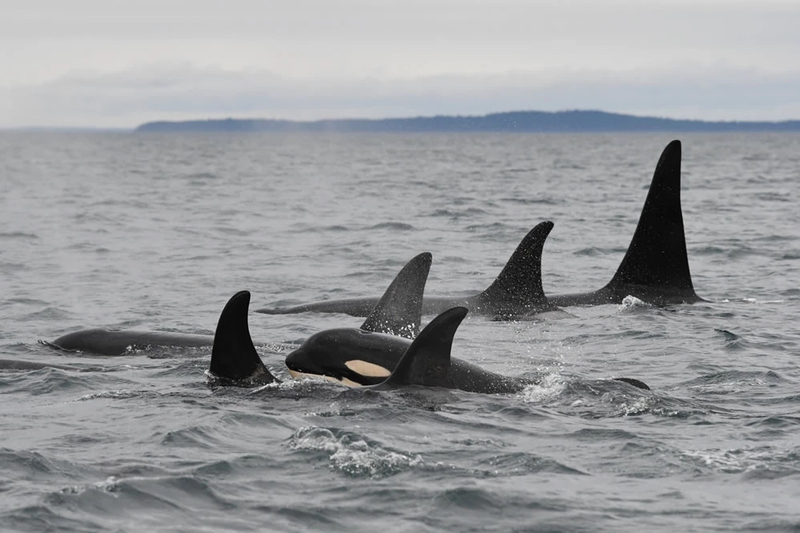 Also included are proposed studies to see how human-generated noise affects the orcas, along with at least one meeting to better coordinate protection and recovery strategies between Washington state and British Columbia in Canada. The Senate bill appeared to be sailing through the Legislature until Wednesday — the last day to approve bills that originated in the Senate. Democrats were anxious about approving two bills before the end of the day — one dealing with student debt and the other with basic education funding. They thought the so-called Orca Protection Act would be approved with barely a bump in the road. The first amendment offered to the orca bill was the “ominously numbered amendment 666,” as Lt. Gov. Cyrus Habib dubbed it while calling on the amendment’s author, Sen. Jim Honeyford, R-Sunnyside. The hostile amendment would remove any prohibition against using drones around killer whales. With an eye toward the clock, the Democrats decided not to fight the amendment. They knew that the House bill was coming later to deal with drones, and they apparently hoped to get quick approval of the Orca Protection Act. After all, everyone was still speaking in favor of it. As you can see in the video above, the Democrats were talking fast. But Republicans along with Sen. Tim Sheldon, a right-leaning Democrat from Hoodsport, appeared to be taking their time. Democrats finally gave up and pulled the bill, essentially killing it for this year. The original bill to limit drones around the orcas, which originated in the House, is still alive after House passage. It is scheduled to be heard on Feb. 20 by the Senate Committee on Energy, Environment & Technology. Some aspects of the Senate bill, such as the extra patrols around the orcas, could be implemented through the budget, according to Sen. Christine Rolfes, D-Bainbridge Island, who chairs the Senate Ways and Means Committee. The House bill is titled, “Concerning the use of unmanned aerial systems near certain protected marine species.” That title does not leave much leeway to resuscitate the Senate bill by heavily amending the House bill, Sen. Rolfes told me. Still, other efforts to protect the orcas could be accomplished with legislative funding of Gov. Inslee’s Southern Resident killer whale recovery program. He is seeking $3 million from the general fund for the next two years. The governor’s proposal goes well beyond the idea of extra patrols around the whales. Included is increased hatchery production of chinook salmon, the orcas’ primary food; restoration of chinook salmon habitat in streams and estuaries; and steps to reduce seal and sea lion predation on chinook, which are also on the Endangered Species List. Inslee’s budget proposal also calls for developing oil spill plans to help the orcas in an emergency, since many experts believe that an oil spill could drive the whales to extinction faster than any other problem they face.